As usual, I’ve been absent for a while. It’s been a very busy summer helping my daughters with various things and with work needing to get done around the house. Scraping and painting a deck is not nearly as much fun as making art, but it has to be done. I’ve decided to take a break from making dragon trophies. Having said that, I wanted to make just one more. And because I have a Facebook account that I never feed I figured I’d post some tutorials there. I know that some of you don’t do Facebook (good for you if you don’t! I really don’t like Facebook as a company, but it was a necessary evil for my art) so I’m going to basically repost here what I put on Facebook, with perhaps a bit more commentary. It will actually flow better in this blog because I can insert photos where they belong instead of as a group at the end of the post on FB. Thanks for stopping by. As I said, I was intrigued by the idea of an “Ice dragon”. Actually, I’ve had a number of requests to make something along those lines. Of course Game of Thrones has a lot to do with this. But Viserion didn’t become what I consider to be an “ice dragon” just because he was now dead. His eyes turned blue and his coloring was more white. Everything else was the same. This drawing by ILoresart,(Gijón, Spain) is more like a real ice dragon. I love the ice horns. In fact, whether or not I could make great looking ice horns became the lynch pin for making the project. I think I will use this photo as sort of a template for the project. 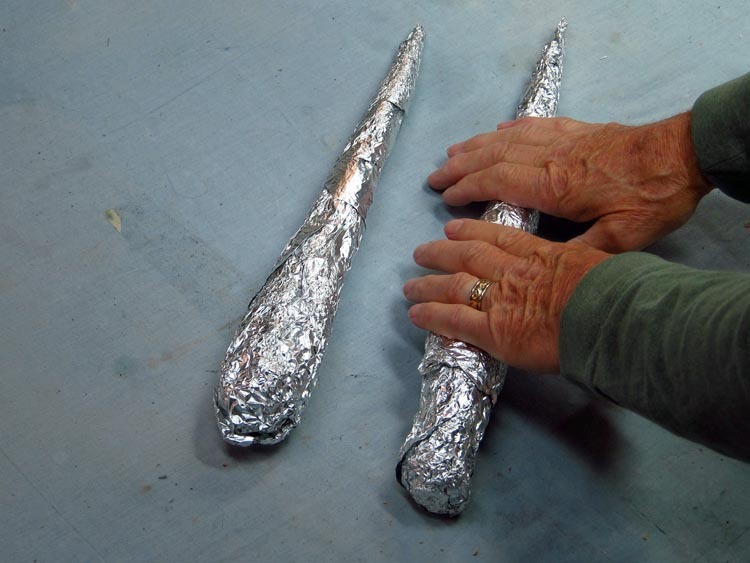 Next post: Making some ice horns. The success of any dragon project depends to a large degree on the horns. I have made dragon horns many different ways. 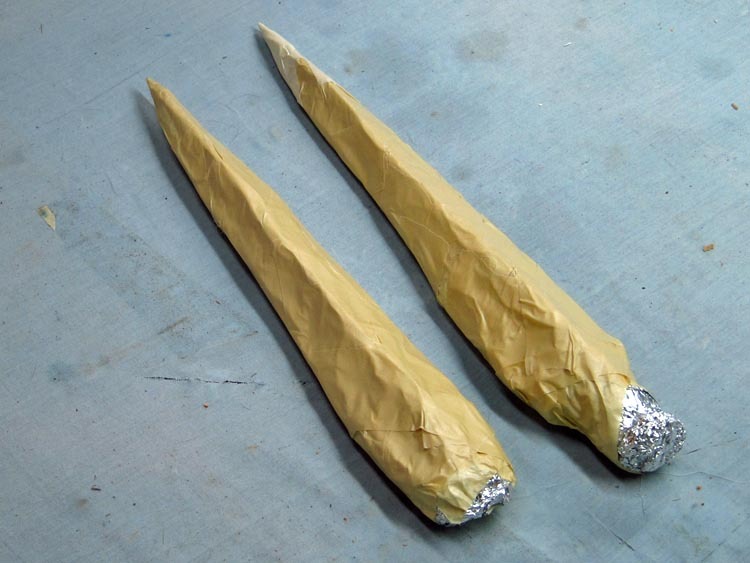 I have made them out of solid polymer clay, or polymer clay stretched over a compressed aluminum foil armature. 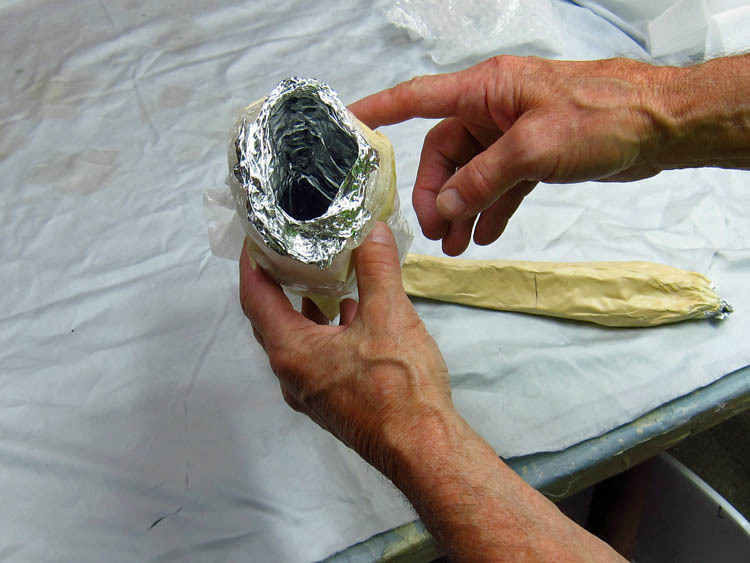 I have just twisted paper around pieces of wire clothes hanger and then wrapped with masking tape, then “cloth mache” (more about that in later posts). None of those methods would work for ice horns. So I decided to experiment with clear casting resin, the same stuff I often use to coat the inside of the mouths of my dragons. It isn’t cheap or easy to use, but it’s the only thing I can think of that would be very hard and clear, like ice. I’m going to describe what I did. I still don’t know how to post photos along with the description. So I will just list my steps and post an album of photos. Hopefully you can see which photos go with which step. 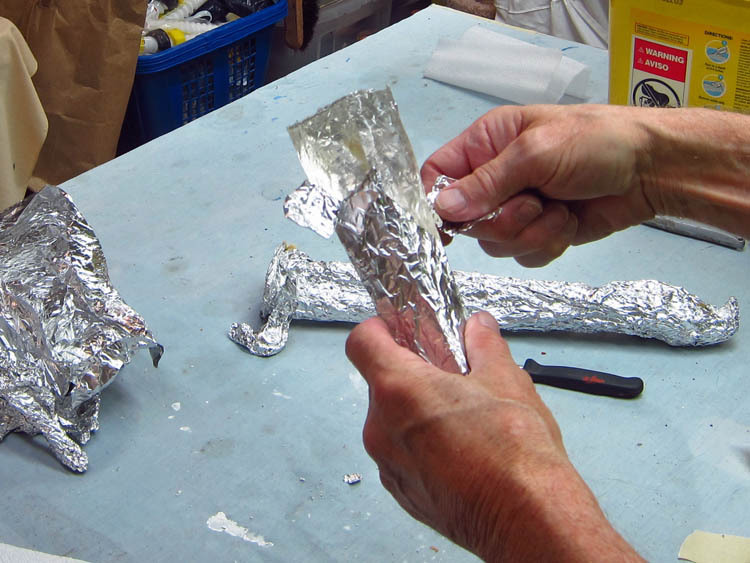 1) I made a pile of thick aluminum foil. I rolled pieces together and compressed them until I got a general shape that I liked. 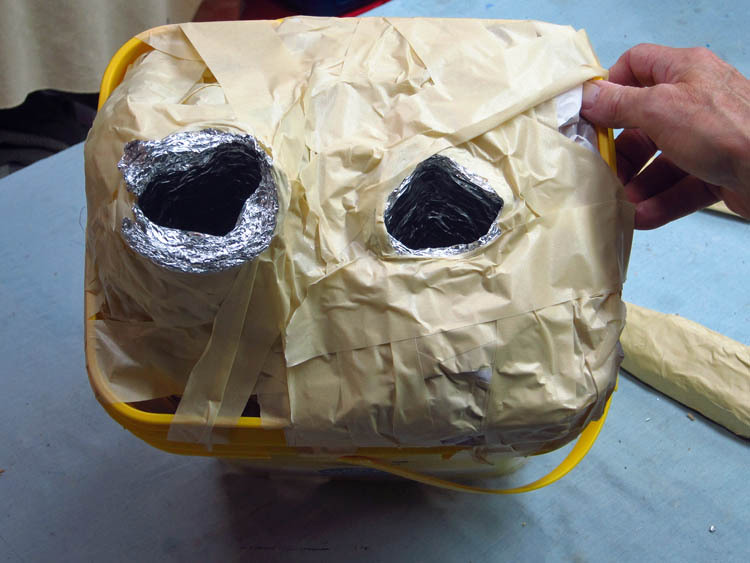 With some final squeezing and a layer of masking tape, I had the shape of the two main horns. I used those to make simple molds. 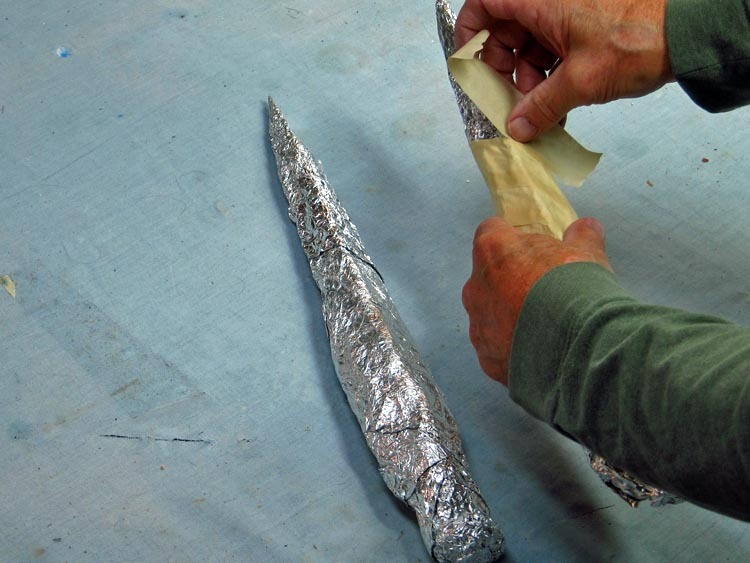 2) To make the molds I wrapped more foil around the horn shapes. 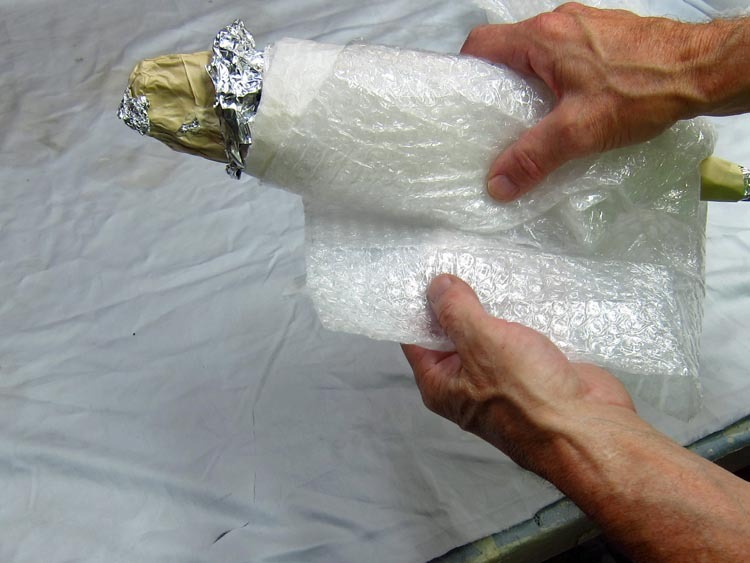 I wrapped that again with masking tape, and then with bubble wrap and newspaper (only because it was handy). 3) I pulled out the horns leaving a rough mold of each horn. 4) I put those into a kitty litter container (I have lots of those around). 6) I poured the resin into the molds and let them sit overnight. 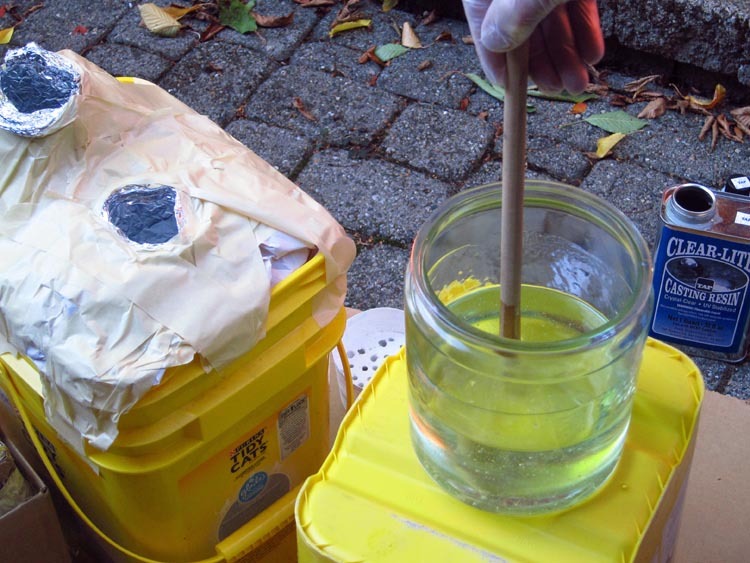 7) The next day I peeled off the various layers exposing the resin. I knew after seeing the first inch of the horn that it was going to be great. Here is how they turned out. Perfect. Because these worked out so well, I decided to go ahead and make the dragon. In fact, this worked out so well I decided to also make the teeth out of “ice” (casting resin). I will show you how I did some of those next post. Meanwhile, I am going to make a few more smaller horn to use for smaller molds. I want a pile of various sized horns. That will take a few days. 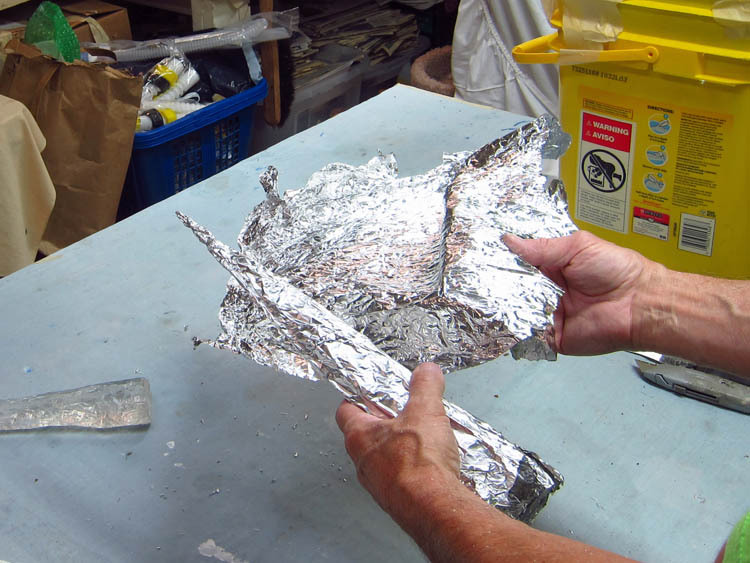 This entry was posted in Paper Mache Ice Dragon and tagged arts and crafts, dragons, Game of Thrones, mixed media, paper crafts, paper mache, paper mache instructions, papier mache, papier mache recipes, sculpture, Targaryen. Bookmark the permalink. Awesome Horns. I like how it came out. Would look cool with some blue LED’s lighting them up. Still love your stuff, thanks for the update. Thanks Ray! Yes, I bought some blue lights. Makes sense with this project. Still haven’t totally decided to use them yet. But I probably will. What a great idea, thank you for posting. This is really inspiring! 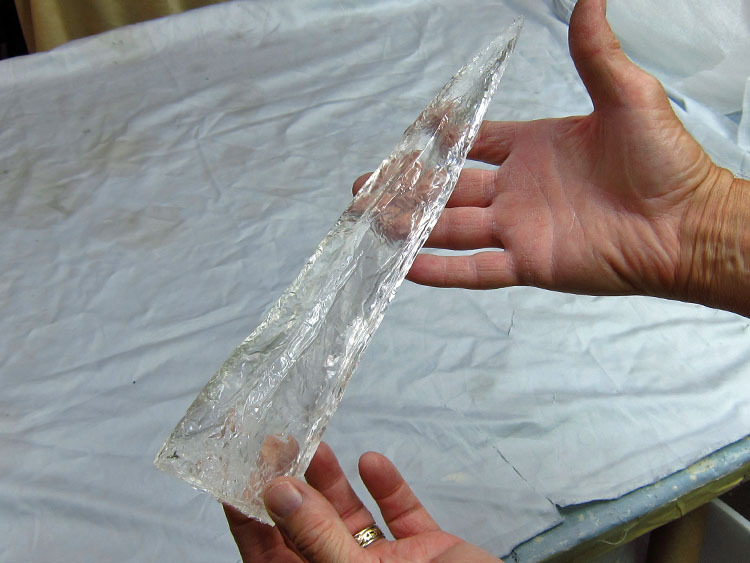 ice dragon horns..I wonder what different ideas, your viewers will come up with, using clear casting resins! Thank you Susan. I’m sure people have already made cool things with this resin. It’s fun to use, although fairly messy and even dangerous. That came out great Dan! The texture from the aluminum foil really gives it an icy look. I agree that blue lighting could be neat. Thanks Rick! I agree about the foil. I was hoping that’s how it would work. This is awesome already! I can’t wait to see the finished dragon- like the idea of icy blue glow- very cool (non pun intended!!) You can also get a nice frosted effect on that acrylic by lightly sanding with super fine grit sand paper if my memory serves me. Thanks Cher. I actually like the way the resin looks as it is. There will be plenty of other places to have a frosty look. That would be a terrific dragon. However in this case I’m just making a trophy, so it would just look like two heads on one plaque. Thank you for the nice comments. Makes my day to see a post, whatever the length in between. I’m so impressed by the ice horns, that I have reconsidered using resin in projects. I have been fearing it because of the nastiness and I haven’t been keen on what I saw others do with it. Is it heavy? as the other things I mentioned not being impressed with, were very heavy, and I usually need things to be not heavy. You are very nice to say that Deborah. Yes, the resin is nasty. I’m always very careful when I use it. I do it outdoors with gloves and eye protection. It isn’t too heavy, no more so that the other horns I’ve made with Fimo or even paper mache. You are very welcome Mihaya! Wow, those came out beautiful Dan! I take it that the tinfoil didn’t stick too bad to that resin? Did you use any kind of mold release before you poured? It sure looks nice! Thanks Sue! The foil didn’t stick too much where it was smooth. It did a little in the crinkles, but I knew that I could use a knife to get it out. This resin breaks in a crystalline way, so when I would dig out pieces of foil it broke just like ice would. So it maintained the icy look. Thanks for the WIP! The texture on the horns is fantastic. Thank you e47art! Yes, I’m happy with how the horns turned out as well. Welcome back Dan and yes those horns look outstanding. I imagine that teeth shall too (Sort of like the Alien Queen’s) so glad you’re back and we look forwards to this latest project. Thank you David! Yes, the teeth are smaller. I will have a post about those a little later. These are fantastic. Perfect, in fact. Can’t wait – it is going to be something else, really. I love watching your projects coming together. I watch, wait and think about emulating but haven’t actually plucked up the courage yet. Well, not the impossible. But that is very nice of you to say Roger! Always love seeing what you are up to no matter how long I n between posts! Can’t wait for the rest of the dragon to evolve from these fantastic horns! Thanks Claire! Glad you are enjoying this. Lovely! 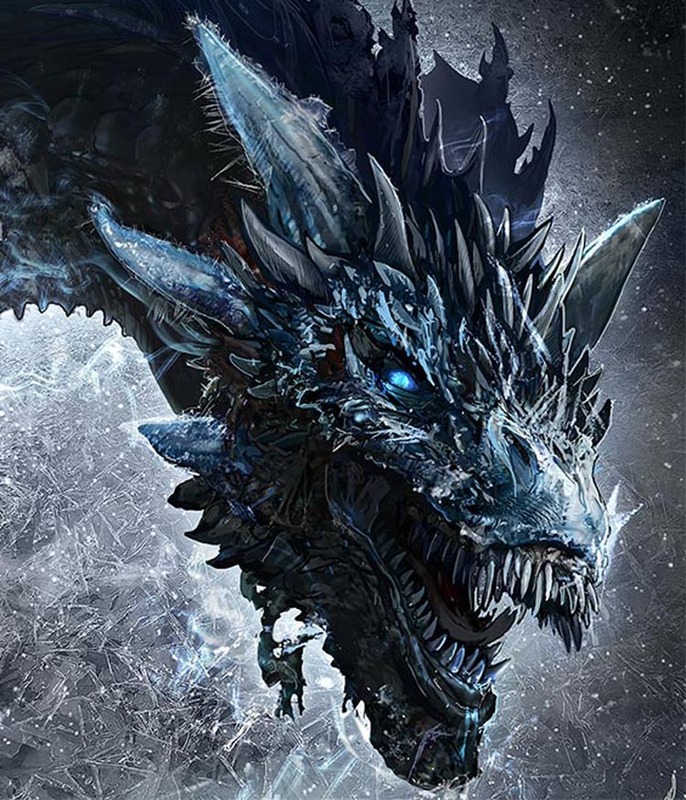 Do Ice Dragons blow frost instead of fire? Thanks Bridget. That would certainly be appropriate! Wow the horn really does look like ice, great job Dan. Love your humour, about the resin in your eyes, pmsl, very funny, keep it coming. Lesley from Australia. Thanks Lesley. I’ve had lots of strange experiences with this resin over the years. I once made a head that I wanted frozen in a jar. All because I found the great glass cookie jar at a garage sale. I put the head in the jar and poured a gallon of that resin in. Of course I always put in way more catalyst than the directions call for. After a short while is started smoking and moving. I had to put it outside of my apartment. I lived on a busy street in Seattle at the time. I had many people wondering about the strange head in the jar with smoke coming off of it and the crazy guy peeking at it out his window. Then again, I was known as “Dan the Monster Man” back then. I was considered the neighborhood crazy artist. Dan, I love reading your posts. I’ve considered working with resin. More on the jewelry level, small stuff to start with. Thanks for sharing your journey. I also have a blog which I need to dust off the cobwebs and post more often! Really cool work! Thank you Sue. Good luck on all fronts!